Strong – contains L-arginine 830 mg/tablet. L-arginine is an amino acid that is needed when the body is under heavy stress. 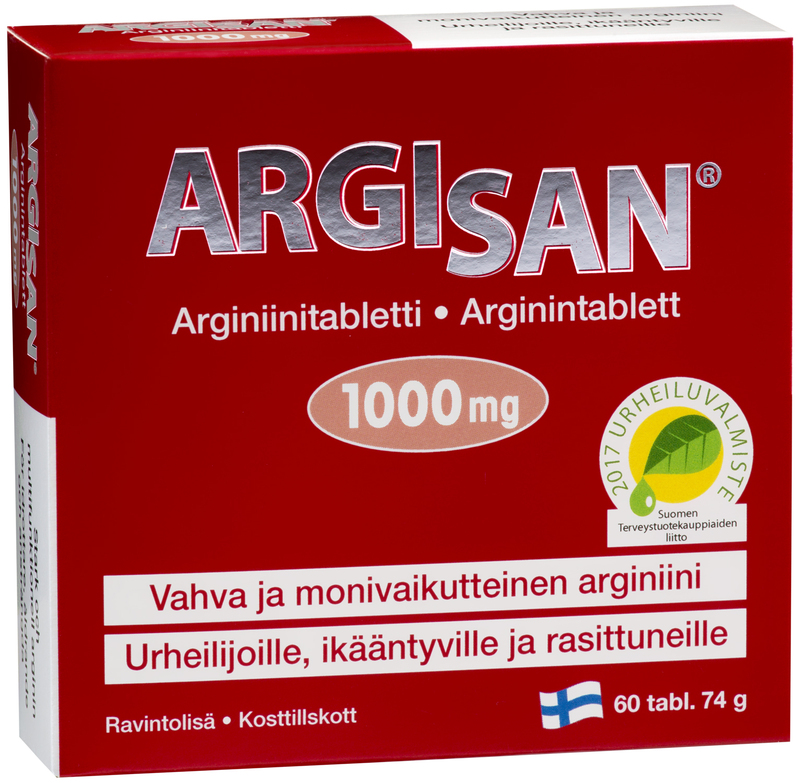 Argisan helps keeping vitality and energy and is suitable for people of all ages. Beneficial especially for ageing people and athletes as well as for people under heavy physical or mental stress. 1-3 tablets per day with liquid on an empty stomach. Not recommended during pregnancy, lactation or for adolescents. Free from lactose, yeast, gluten or sweeteners. Suitable for vegans. Amino acids act as intermediary agents for different substances in the human body, such as vitamins, minerals, fatty acids and hormones. Many absorption disturbances and shortages can derive from the lack of amino acids that forward essential substances from the liver. There are over 300 amino acids, 20 of which exist in the human body’s proteins. Eight of these amino acids required by humans are called essential amino acids and they must be obtained from dietary sources. The human body can also synthesize amino acids from other amino acids obtained from dietary sources. However, the formation of arginine and histidine, for example, is very minor. The human body’s own production is not sufficient to cover the need for arginine, especially during mental and physical strain. Good arginine sources include peanuts, peas, onions, sun flower seeds, rye bread, meat and fish. Arginine is an amino acid that increases the production of nitric oxide in the human body. Nitric oxide has an important role in the vascular system as it acts as an intermediary agent for vital functions, for example, it widens the veins, which is essential for vital tissue capacity during physical strain (e.g. for athletes). Arginine is important for the energy production of muscles as well as for the well-being of the heart and vascular system. In addition, arginine supports the immune system. Arginine can decrease blood pressure. People with a low blood pressure level should take this into consideration.